This is all I need to see to have heart palpitations: the third Vampire Empire book by Clay and Susan Griffiths. There's no blurb, yet, but I can't wait to see what happens in Equatoria. Look at that cover! Look at the determination on Princess Adele's--or shall I say Queen Adele's--face and that hand can tell fans A LOT. Is that Greyfriar unveiled? 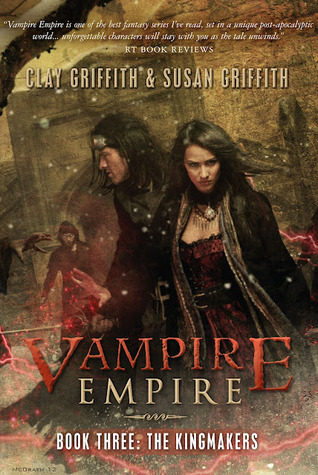 And get a look at those vampires--not a sparkling one in the mix. I am so waiting patiently for this book. The Kingmakers (Prometheus) should be out the first week of September. Add this to your Goodreads. 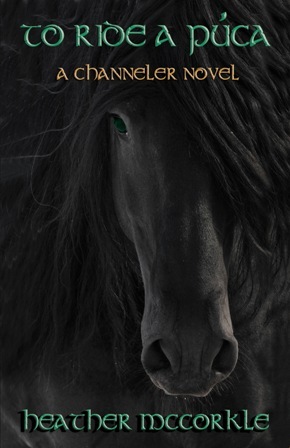 I'm all too aware of cover love for all of the YA books sporting pretty girls in gorgeous dresses but look at this cover, isn't that a beautiful animal? Not since Black Beauty has a horse cover made me stop and stare. And the font looks Celtic and magical. Invaders, Druids, fighting for a homeland, To Ride A Puca sounds like it has everything fantasy lovers want. Blurb: Invaders are coming to take what isn't theirs, again. Persecuted, hunted down, forced to live in obscurity, the druids have all but given up. Can the determination of a girl who has barely come into her power bring them together? Or, just when she finally finds her place among her kind, will they end up losing a homeland their very magic is tied to? Add this to your Goodreads. Though To Ride A Púca is a channeler novel, it is not part of the series. It's a stand alone novel that is a tie-in which explores the history of the ancestors of one of the main characters in the channeler series. It will release in both hardback and eBook formats this May. To Ride A Puca, will be published this month by Compass Press (hardcover, First Edition). Now you know what we're looking forward to, how about you? What are you waiting to read? I'm so flattered, thank you so much ladies! :)This month I'm waiting on Mea Culpa by Christine Fonseca.